Aboard Belmond Amaryllis you’ll look forward to settling in for the night. Grand cabins of muted palettes, fine fabrics and floral accents promote rest and relaxation. En suites are spacious and gleaming. By day, large picture windows ensure you stay connected to the beautiful Burgundy scenes drifting by. Generous king or twin beds make for a restful night’s sleep. En suites boast overhead showers or baths and dual vanities. Large windows give way to spacious decks. Unwind in the air-conditioned cool while the sun-dappled countryside passes by. 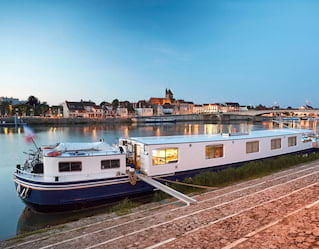 Be part of history with a stay on this vintage 1962 barge, designed in conjunction with La Fluviale, a prominent boat company in Saint-Jean-de-Losne. A 40m Dutch Hull, the Belmond Amaryllis barge has been decorated by some of the most respected names in France and Italy.